On Saturday 2nd April, two organisations, Waging Peace and Football for Hope, Peace and Unity (FHPU), brought teams together for a tournament to mark the United Nations International Day of Sport for Development and Peace on 6 April. FHPU is the vision of Eric Murangwa. As a former football player with the Rwandan national team, who only survived the 1994 genocide due to the compassion of his team mates, Eric’s idea was to use sport in pursuit of reconciliation. 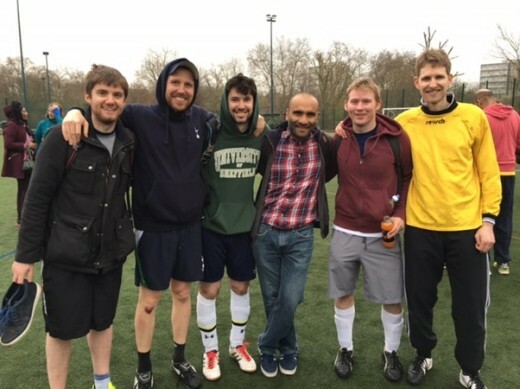 On the bill was a 5-a-side football tournament, giving a chance for survivors of genocide and mass atrocities around the world, including from Rwanda and Sudan, to get together in a spirit of commemoration and hope. The event turned out to be as uplifting and unifying as the billing promised, but at that moment Wilsons:FC were pretty pumped for the football itself. Not long after Wilsons’ first game against the “Go Dolphins” had kicked off, Bicknell of Wilsons was right in there with a couple of vital fouls, expertly disguised as robust tackles. Wilsons were struggling to get to grips with the slippery Dolphins, with Davies called upon to make a couple of smart stops in goal. But then, out of nothing, Nunn played in Paramesvaran with two uncharacteristic defence-splitting passes, which Paramesvaran calmly tucked away to give WIlsons a two-nil half time lead. A further three unanswered goals would follow for Wilsons, the pick of the bunch being a once-in-lifetime piece of trickery by Nunn, and Paramesvaran duly completed his hat-trick. But had Wilsons:FC they given too much in their first game to have anything left in the tank for “El Clásico” – Duncan Lewis v Wilsons? With the scores at nil-nil, “The Duncans”, as they had become known to fellow participants, burst clear of the Wilsons defence but when a goal looked inevitable, Spray produced one of the most impressive, and certainly one of the most important, goal-line clearances of his career. And then on the stroke of half-time, fox-in-the-box Merriman prodded past the thus-far inspired Duncan keeper to put Wilsons in front. A second for Wilsons followed not long after half-time. A dipping strike from Bicknell from the most unlikely of angles. But Wilsons’ stride was checked in rude fashion as Duncan Lewis maestro Toufique Hossain grabbed a quick-fire double, dancing through the Wilsons defence and firing past Davies with ease. The Wilsons players exchanged disconsolate looks. Two points dropped beckoned. But Spray had other ideas, latching onto a loose ball and drove the ball home. A famous victory for Wilsons:FC. But the first two games had taken their toll physically and Wilsons now faced Team Rwanda’s Second Team, not short on talent, but nevertheless without a win to their name. Team Rwanda 2 made Wilsons look embarrassingly second-rate in front of a partisan crowd. Wilsons might nonetheless have scored a few themselves had it not been for an outstanding performance from an unbeatable Rwandan keeper, but in the end could consider themselves lucky not to have been beaten by a wider margin than the 2-0 score-line which resulted. But Wilsons could not dwell on this for long as they immediately faced team Rwanda’s first-team for a place in the final. And Wilsons were immediately on the back foot as their frailties were exposed in an impromptu pre-match dance-off. But right from the referee’s whistle, Wilsons got stuck into their task. Nunn and Spray at the back restricted the Rwandans to just a few sights of goal. But Wilsons’ firepower was waning it was the Rwandans who looked the more likely to score. Wilsons held firm and as a Rwandan corner was cleared, the final whistle went. Penalty shoot-out! The scene was set for Wilsons to play the pantomime villains, to break Rwandan hearts. But it was not to be. The Rwandans, clinical in their finishing and their goalkeeping, soared to a 4-1 shoot-out victory, before sauntering over to the show-pitch and defeating their opponents in the final by a similar score-line in normal time. The tournament ended with all participants forming a group huddle in the fading daylight. Words were spoken about the significance of the event and the importance of participating rather than winning. Wilsons:FC agreed wholeheartedly, although they pointed out that it was important that they had beaten Duncan Lewis too. Then the winning captain, after raising the trophy (a homemade cake in a plastic carrier bag) aloft, demonstrated admirably how football banter and a genuinely moving message of memorial and hope could be combined to form a fitting finale to the event. It had been a thoroughly enjoyable and uplifting day.